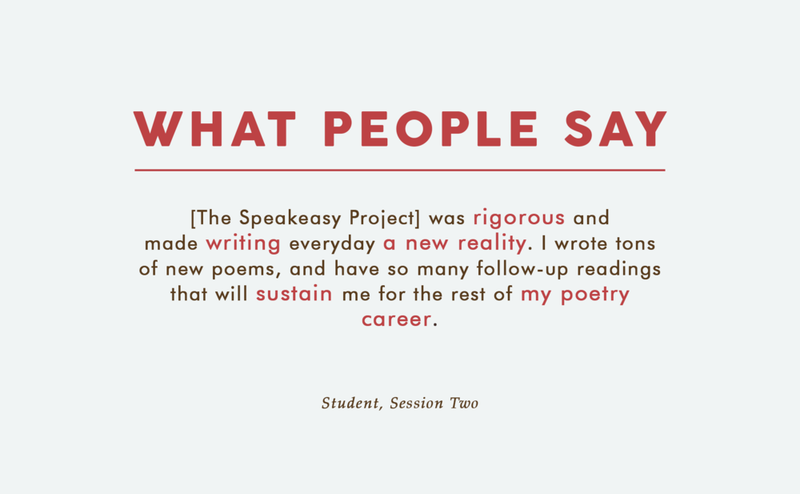 Every winter, spring and summer, The Speakeasy Project hosts a four-week long workshop for students of all ages and backgrounds. These workshops are available in poetry and creative non-fiction. They are hosted completely online. This workshop centers itself around small-group mentorship. Each group consists of one mentor and six students, while each month-long session consists of about six to ten mentors. The syllabi for the workshop are crafted in a way that forces students to read and write every day. We believe strongly in the power of daily ritual towards the production of art. Click for a sample from one of our poetry syllabi. Groups or "pods" will meet twice a week for a one-hour lecture period and a two-hour workshop period. The lecture will consist of a small, prepared talk centered around the topic of the week and followed by discussion and Q&A. Previous weekly topics have been selfhood (identity, artistry, personhood, representation, the body, the mind), technique (form, space, breath, rhythm, movement), and/or other various thematics. The workshop will consist of a small-group, open editing period for each student. Students are expected to not only engage with their mentors, but with their peers as well. This includes reading and writing comments for their peers' work before each workshop period. Workshop structures vary from mentor to mentor; however, we recommend that students submit at least two poems or one story each week for workshop. 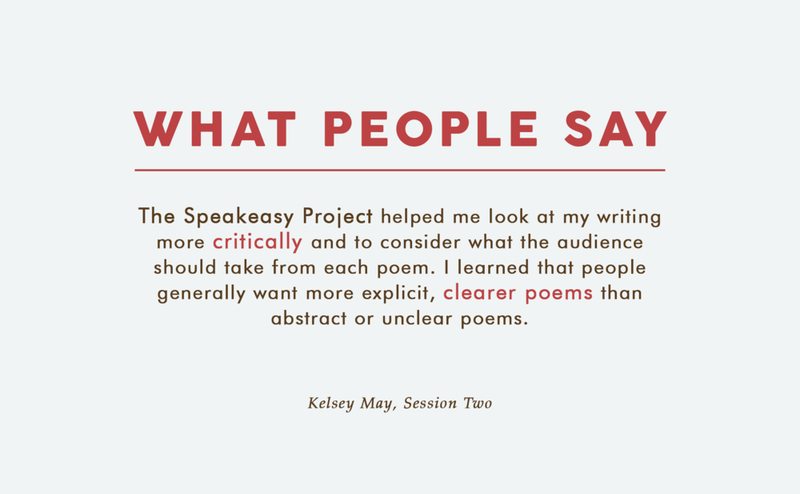 At the end of the workshop, we collect work from students and mentors alike into a singular anthology. We offer substantial scholarships to students based on need. Over 60-70% of our students receive partial to full scholarships for our workshops. If you intend to apply for financial aid, please fill out the last three questions on the application. Please be mindful of other students when applying for assistance. TIMES FOR LECTURES AND WORKSHOPS DURING THE SESSION ARE LISTED ON THE APPLICATION.